Webster alumni and DAU fellows Bryan R. Cleve and Corry B. Cox with Fort Leavenworth director Katie Ervin. Two Webster graduates recently completed the Defense Acquisition University (DAU) Senior Service College Fellowship program (SSCF). The fellows spend 10 months in the program and all take classes through Webster. Two of this year's fellows, Bryan R. Cleve and Corry B. Cox, also completed their MA in Management and Leadership from Webster during this time. 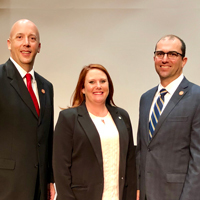 Katie Ervin, Webster's midwest regional director and Fort Leavenworth campus location director, presented them with their degrees at their graduation ceremony at Redstone Arsenal, Alabama. The SSCF career development program develops civilian acquisition leaders in preparation for roles as product and project managers, program executive officers, and other key acquisition positions. SSCF also helps prepare participants for positions in the Senior Executive Service (SES). The program is intense but makes sure to provide the time to think and reflect—something not always available in the government workplace.